What I am about to show you is one of the most inspiring responses to the anti-tumoral actions of marijuana. It comes from the following case study provided by an Ontario oncologist. It clearly demonstrates in great detail how effective full-spectrum cannabis can be in treating one of the most pernicious forms of leukemia. Normally this condition is approached using chemotherapeutic drugs, radiation, and/or a harrowing bone marrow (stem cell) transplant which entails great risk to the patient. Oncologists don’t like to admit it but these procedures can sometimes either kill the patient outright or leave them extremely debilitated. One can almost always anticipate complications during a transplant since the patient’s leukemic bone marrow is “wiped out” with potent chemotherapeutics. Your bone marrow houses all of your immune cells. Patient with no immune cells for any period of time are extremely vulnerable to overwhelming infection. In other words the treatment for this virulent form of ALL is often times as mortiferous as the disease itself. The word “acute” in acute lymphocytic leukemia comes from the fact that the disease progresses rapidly and creates immature blood cells, rather than mature ones. The word “lymphocytic” in acute lymphocytic leukemia refers to the white blood cells called lymphocytes, which ALL affects. 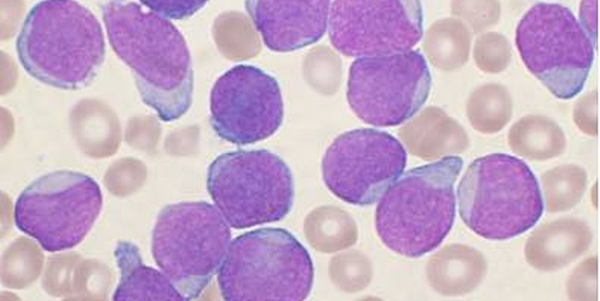 Acute lymphocytic leukemia is also known as acute lymphoblastic leukemia. • Chemotherapy. Chemotherapy, which uses drugs to kill cancer cells, is typically used as an induction therapy for children and adults with acute lymphocytic leukemia. • Targeted drug therapy. Targeted drugs attack specific abnormalities present in cancer cells that help them grow and thrive. A certain abnormality called the Philadelphia chromosome is found in some people with acute lymphocytic leukemia. For these people, targeted drugs may be used to attack cells that contain that abnormality. • Radiation therapy. Radiation therapy uses high-powered beams, such as X-rays, to kill cancer cells. If the cancer cells have spread to the central nervous system, your doctor may recommend radiation therapy. • Stem cell transplant. A stem cell transplant may be used as consolidation therapy in people at high risk of relapse or for treating relapse when it occurs. This procedure allows someone with leukemia to re-establish healthy stem cells by replacing leukemic bone marrow with leukemia-free marrow from a healthy person. A stem cell transplant begins with high doses of chemotherapy or radiation to destroy any leukemia-producing bone marrow. The marrow is then replaced by bone marrow from a compatible donor (allogeneic transplant). No alternative treatments have been proved to cure acute lymphocytic leukemia. Dear reader, one last thing to keep in mind: the below featured patient FAILED numerous highly toxic rounds of chemo and radiation. It did nothing for her cancer but it did harm her deeply putting the cannabis preparation’s foot to the fire. In nearly every case I come across these end-stage patients are practically moribund before they earn the right to try something not on the hospital’s formulary. That needs to change. So it’s even more impressive that the oil of cannabis succeeds in reducing her blast count when the most effective chemo fails. This miraculous accomplishment takes place right under their noses with a deaths-door patient severely ravished by chemoradiation. This is a case study involving a 14-year-old girl with the most aggressive form of acute lymphoblastic leukemia (ALL). It’s the Philadelphia chromosome positive form of ALL. This arrangement makes it very aggressive and difficult to treat. These observations were first published in 2013 in the journal Case Reports in Oncology. 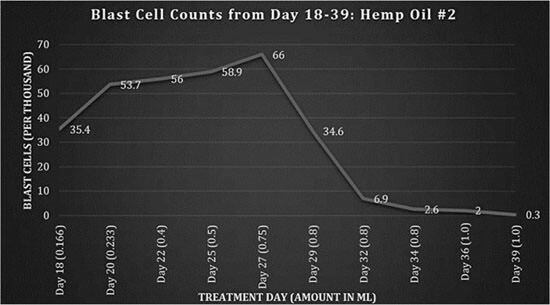 In it the author documented a dramatic, and quite unexpected, dose-response decrease in her leukemic blast cell count due to the consumption of nothing else (at that time) but an extract of marijuana. What I really liked about this published study is that it provides the reader with many of the details not seen when individual laypersons report their anecdotal responses to marijuana. Often times these circumstantial sagas leave me with more questions than they answer. It’s refreshing to see a professionally compiled publication documenting the miraculous effects of pot with actual laboratory data. Even if it’s only one case the astonishing decrease seen in her “blast cell count” is unbelievable to say the least. This is one of the best-illustrated cases available in the literature. What still surprises me is how apathetic the media and drug companies are regarding bona fide cancer remissions using cannabis oil. Sadly this tactic may be the default reaction to canna-cures from the drug industry since the essential oil of cannabis is not a patentable “drug.” Drug companies prefer a patented synthetic analogue of just one component to make a magic bullet if you will. This alone will take an additional ten years on top of the ten years needed to study the essential oil in clinical applications. Furthermore, it’s well documented that magic bullet cures for diseases, especially cancers, have never panned out the way the pharmaceutical houses had anticipated. Magic bullet cures for cancer simply do not exist even after forty-five years of R & D. But they keep going in that direction anyway. That’s the reason why chemotherapy is so popular-it makes lots of money for drug companies but it’s a crummy way to treat cancers. That’s very disturbing to me when we have something that seems so remarkably effective and profoundly safe. Especially when we compare it to the deadly drugs currently on the formulary to treat this disease. Sadly the chemoradiation caused the premature death of this patient while the cannabis was curing her! I think you’ll agree with me after you read the below study that no matter what the difficulties are in researching canna-oil, said studies need to be done ASAP because if anything is a magic bullet it’s cannabis oil. Cannabinoid resin extract is used as an effective treatment for ALL with a positive Philadelphia chromosome mutation and indications of dose-dependent disease control. The clinical observation in this study revealed a rapid dose-dependent correlation. P. K., is a 14-year-old female resident of Ontario, Canada. In 2006 she presented with symptoms of weakness, shortness of breath, and bruising when she was taken to the Toronto Hospital for Sick Children on the 10th of March. There she was diagnosed with acute lymphoblastic leukemia (ALL), with >300,000 blast cells (immature leukemic cells) present in her blood. After three years of unsuccessful chemoradiation and a failed stem cell transplant, she was deemed a conventional treatment failure. Numerous rounds of radiation and chemotherapy did nothing. A second bone marrow transplant was not recommended. She was subsequently placed in palliative home care essentially to die. As such she was told by her oncologist to prepare for her disease to overwhelm her body and from which she would suffer a stroke within the next 2 months. Most likely she would die from the complications. Like many of the resolute patients that you read about here the family wasn’t ready to roll over and accept a death sentence for their daughter. They decided on a move that thousands are calling a cancer cure. While loudly singing “cancer busters” to the tune of Ghost Busters and steadfastly urged by her father’s research efforts, they decided to contact Rick Simpson the legendary architect of Rick Simpson Oil (RSO). RSO is an essential oil of cannabis extracted, in this case, with 99% isopropyl alcohol. RSO is becoming mythical in the lay communities for healing dozens of disparate diseases and driving numerous deadly cancers into remission. 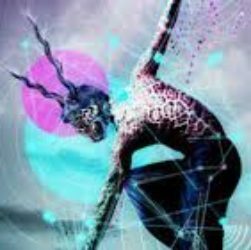 Even the professional community is taking notice-finally. The strain used was called Chronic, a hybrid of Northern Lights and several other hybrids such as AK-47. The proper way to dose this material is to start off by eating a super-tiny amount and wait a few hours to see where it takes you. Remember this preparation is full-spectrum meaning that it is loaded to the gills with a very high percentage of THC. The idea is to start slow and increase at a pace you or your cancer determines. For example, if you are riddled with metastatic disease you cannot afford the luxury of time so you’ll increase your dosing quantity very quickly-let’s say in two to three days. Others who have some time may take a week or longer to achieve the coveted one gram per day level. The anti-cancer dose that most caregivers are satisfied with is orally taking a gram of RSO per day divided into three or four doses. One gram is roughly one ml on the graphs shown below. She started out in the prescribed fashion by ingesting a tiny half-grain of rice size of the potent elixir. That was day zero. 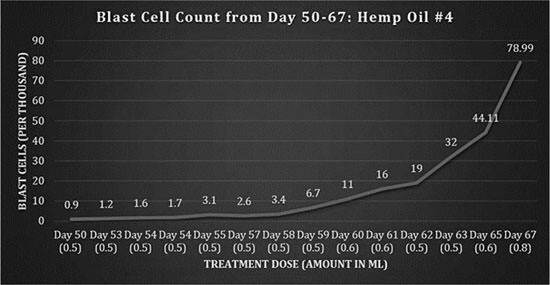 See the below graph in which her oncologist plotted the effects of cannabis versus blast cell count (BCC) and dose in milliliters of RSO. View the BCC as a marker for ALL. When the BCC drops her disease is losing its foothold on her. As it approaches zero she is in remission. From the graph we see that she had an extremely high blast count peaking at 374,000 which normally would keep rising. However, by day eight she was rapidly responding to the anti-tumoral actions of marijuana resin as she gradually built up a tolerance to the RSO and was able to increase her dosing. Initially she had a tough time taking the potently psychoactive RSO. Even with tiny doses she reported several panic attacks along with increased appetite and fatigue. The panic attacks may be due to the strain chosen which had some Sativa hybrids in it. Usually Mr Simpson and others who use this medication prefer to stick with the Indicas which tend to make you sleepy rather than stimulated. This helps you avoid panic attacks and anxiety while allowing you to dose higher. The Indicas encourage sleep to help heal. After day 15 the original Chronic strain RSO was consumed to be replaced by a new (unknown) strain for the next round of dosing. As you can see from the below graph her blast count started to rise again doubling by day 27 to 66,000. Right at this point the dosing was increased from 0.5 ml on day 25; to 0.75 ml on day 27; and finally to 0.8 ml by day 34. Then something very interesting happened. Her blast cell count suddenly plummeted to 6.9 by day 32. Meanwhile, some additional blood chemistries revealed that her uric acid levels were through the roof which started to produce joint aches and pains. Similar to acquiring the disease gout she was successfully treated pharmaceutically with allopurinol. But the fascinating thing is that all of the uric acid, her doctors determined, was coming from “tumor lysis syndrome.” This indicates that the cannabis preparation was so potent that it was killing off her blast cells with unheard of efficiency leaving her body to deal with the biochemical debris (uric acid) from an exponential die-off of cancer cells. In fact, the cancer-killing effects were more dramatic than any known chemotherapy drug and hugely successful in treating her ALL. She was aggressively driving her ALL into remission. On day 43, a new batch of hemp oil from an Afghan/Thai strain (referred to as Hemp Oil #3) prepared by the family was administered. Above you can see the very low titer of blast cells showing how effective the preparation was. At this point she was essentially in remission with a fraction of the blast cells she previously had. At around day 50 a new RSO formula was used. Keep in mind that the chemo drugs she was previously given only made her sick, malnourished, and vulnerable to infections. Due to the cataclysmic effects of the chemo she was not able to take foods orally during this period. Several complications from her previous chemoradiation emerged. Since she was constantly nauseated and unable to keep food down she needed to be on TPN (feeding through an IV) to prevent further malnourishment. In light of the difficulties regarding oral feeding her dosing of RSO was decreased from three times per day to two. That change led to an increase in her blast count. Note that at times she was only receiving half of the recommended one gram of RSO per day. This was a terrible mistake. 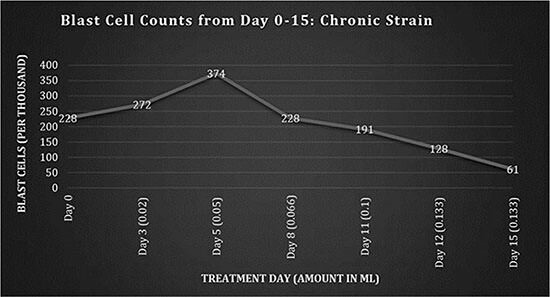 The dosing regimen was intermittent until day 59, remaining at 1-2 doses per day of 0.5 ml. As the blast cells began to increase and the patient’s appetite increased, the dosing frequency was again increased to 3 times per day starting on day 62, and the amount administered was increased from day 65. On day 68, a new batch of medicine was obtained by the family referred to as Hemp Oil #5. As you can clearly see there is a powerful dose-response decrease in her blast count, once again demonstrating that it is from the “hemp” oil and not a coincidence. Also during the 78 days of RSO she was taking absolutely no other anti-cancer medications. Her doctor confirmed that this was not a spontaneous remission but due to the ingestion of cannabis essential oil. 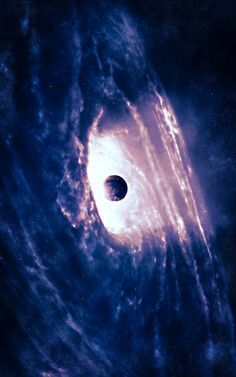 This is similar to a re-challenge effect where a medicine is stopped allowed to clear and then restarted to ascertain its true efficacy. It appears that the increased dosing of the RSO is responsible for this turnaround. Lastly, we have the graph featured below which is a summary of the entire 78 days she was on RSO. Although much more research is needed this graph clearly offers “proof” of efficacy even to steadfastly conservative mainstream oncologists who are very hostile to using “unproven” (err unpatented) drugs. I am curious, would the outcome have been better had she refused chemoradiation or a bone marrow transplant? Even the author admits that the chemo substantially harmed her and led to her death. I suspect that she would still be alive today if she had only used RSO at the correct dose, and began her treatments the week she was diagnosed with ALL. The previous chemoradiation had such an appalling effect on her health that she was never able to recover from it. The conventional treatments, and the disease, led to a severe neutropenia: a scarcity of an important immune cell line called neutrophils. These cells are the first to arrive when a patient develops an infection which ultimately caused in her case a bowel perforation, peritonitis, sepsis and death. Often times in cases like this the oncologists wait far too long before trying cannabis oil. This therapy has to be viewed as polytherapy, as many cannabinoids within the resinous extract have demonstrated targeted, antiproliferative [not able to reproduce], proapoptotic [inducing cell death] and antiangiogenic [halts new blood vessel growth in tumors] properties. This also needs to be explored further, as there is potential that cannabinoids might show selectivity when attacking cancer cells, thereby reducing the widespread cytotoxic effects of conventional chemotherapeutic agents. It must be noted that where our most advanced chemotherapeutic agents had failed to control the blast counts and had devastating side effects that ultimately resulted in the death of the patient, the cannabinoid therapy had no toxic side effects and only psychosomatic properties, with an increase in the patient’s vitality. Another important point: as you can see from the above data the patient’s RSO formula was different each time they made a new batch. This is dreadfully inconsistent. Ideally we want one type of RSO made from the same varietal or at least the same species (Indica) each time. Based on the graphs presented, the patient’s daily dose is indicated in parenthesis in milliliters on the horizontal coordinate. Although from the discussion versus the graphs it is not entirely clear what she received each day, we’ll have to assume that the amount in parenthesis is the total daily dose. If it is then she never received the recommended total dose of one gram (approximately one milliliter) per day for much of her stay. Only on day 29 did she start to receive (close to) one gram per day total until day 39. The dose was decreased again by day 44. Then only the final 12 days did they return to 0.8-1.0 ml dose. Increasing the dose in response to an increasing blast count and then decreasing it as the count drops was a bad idea. Yet, in spite of an inconsistent black market pot supply and the likely underdosing, the results speak for themselves. With odds incredibly stacked against this brave young soul she nearly cured herself! In fact, she did “cure” her ALL but the chemoradiation had destroyed her ability to recover. 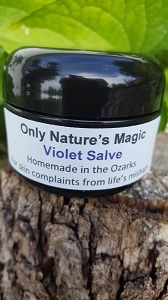 What we have here is a crude weed extract made from a half-dozen differing varietals that any cave dweller could make blindfolded with one arm. Although it was probably full of impurities and differed in potency from batch to batch, we just witnessed an event that made the multi-billion dollar chemoradiation franchise look like a Keebler Elves bake sale. Why isn’t this making front-page news around the world? Clearly, for every critic to see with real data graphs, the anti-cancer activities of RSO are far more efficacious than the best chemo they offer. Plus it isn’t going to kill you to cure you. Think about this for a minute: a crude pot extract did this. Now where does that leave us? Well, we have a non-toxic drug that works overnight to kill blast cells, and it put ALL into remission in a matter of weeks. If that’s not a magic bullet then I don’t know what is. Dr. Christopher Rasmussen MD,MS, an anesthesiologist with a Master’s degree in traditional Chinese medicine, is a professor, lecturer, seminar provider, and world authority on preventive medicine. 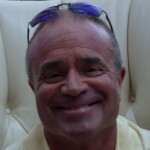 For more information on preventive medicine see www.inflaNATION.com.